It has been FOR EVER since I've posted a blog and I really need to get back into doing this... Truly, I feel like the past year or so has just flown by and every time I meant to get on here I blinked and it was two months later. LOL. Anyway, I'm not only on here to comment about my absence, but to let you all know that my next book will be out within the next Month or so. 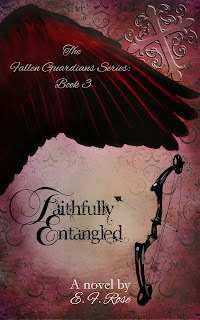 That's right, book 3 in my Fallen Guardians Series is done and in the midst of editing as we speak. And speaking of my next book... Check out this gorgeous cover!! Oh, yeah!! Eek! I am sooo excited to get this book out and into your bookcases and kindles. It won't be too long now, as I said it's getting edited and I just now sent it to my beta readers... I'll have more info for you all concerning Faithfully Entangled soon and look forward to sharing Nicky's book with you all in the near future... Love you guys! Now its's back to working on my next project while I wait to hear back from my betas. Bye for now My Loves!